If it can make Madonna look human, just imagine what it could do for you. Apparently Adobe Photoshop Beauty Cream is also safe to rub in your eyes. Don’t mind the stinging. That’s totally normal. Temporary blindness might also occur. In fact, it probably will, but it’s so worth it. Beauty is pain! Unfortunately pain hurts. 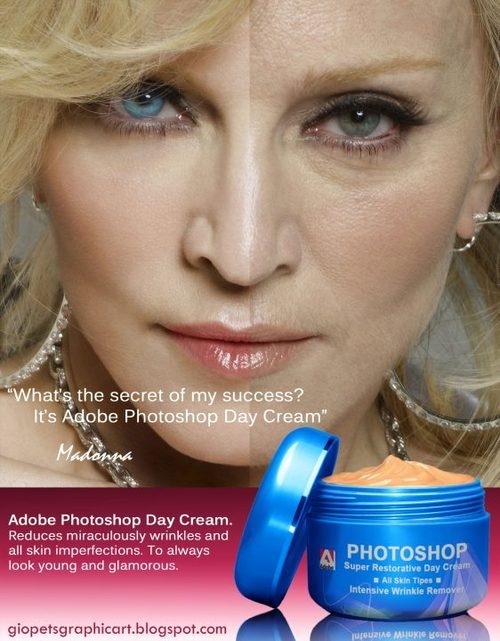 Achieve that wrinkle-free Photoshop glow with Adobe Photoshop Beauty Cream. Coming to soon to the beauty section of your local Walmart. Or you can just make a Photoshop Mask. Ha fantastic. Great concept and well done. Kudos. typo – “all skin types” but still a great ad & an excellent execution! hm…tats wht we designer do in all the graphics….its too funny….